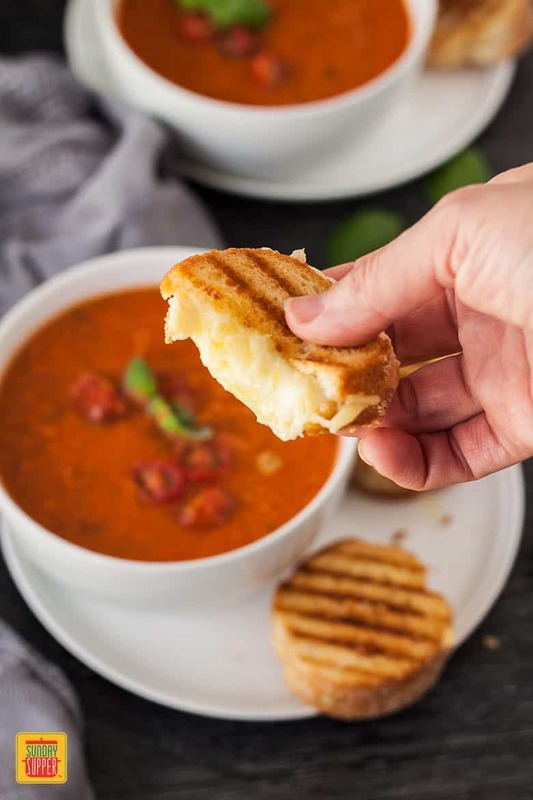 Grilled Cheese and Tomato Soup is classic COMFORT FOOD! Fresh ingredients maximize flavor and the mini grilled cheese sandwiches are the cutest ever! Tomato soup for me, growing up was of the tinned variety. Salty with just a little sweetness from the tomatoes but so comforting. 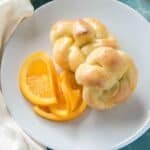 We would toast some bread, slather it in butter then dip it in the soup. Although I’m not a fan of soggy bread and that piece of toast moved at lighting speed from the soup to my mouth so I could devour it while still crunchy. This Roasted Tomato Soup is all that, on steroids. Mini grilled cheese and tomato soup totally homemade with sun-dried tomato pesto is classic comfort food made better! 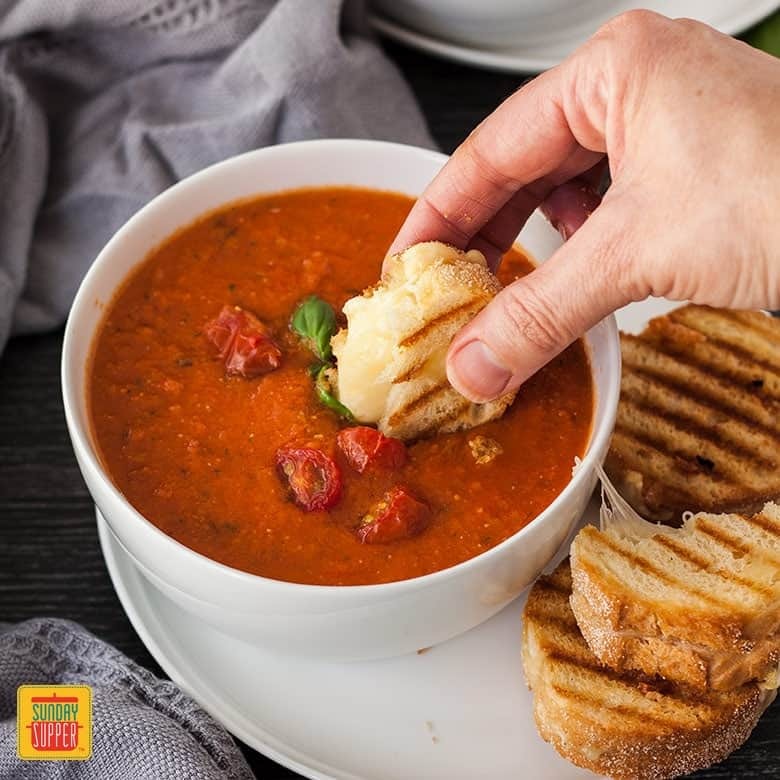 Kids and adults alike will LOVE dipping the mini grilled cheese in the tomato soup! Plump, ripe roma tomatoes and a few little sweet cherry tomatoes are roasted until they get a little caramelized and release their juices. Roasting the tomatoes intensifies their flavor but also adds some sweetness. 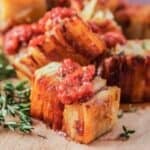 Onion and garlic are roasted together with the tomatoes until soft and sweetened. If you haven’t tried roasting garlic, you really must. 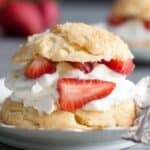 It mellows out the flavor but also makes it incredibly sweet and creamy. To finish off, it all goes into a blender with the pan juices and some broth, then blended until as smooth as you like it. Cook it a little longer in a saucepan with some salt, pepper and dried herbs and you’re done. 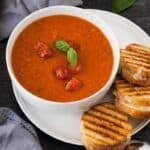 For more comforting soup recipes, how about this Easy Broccoli Soup or this Roasted Red Pepper Tomato Soup. 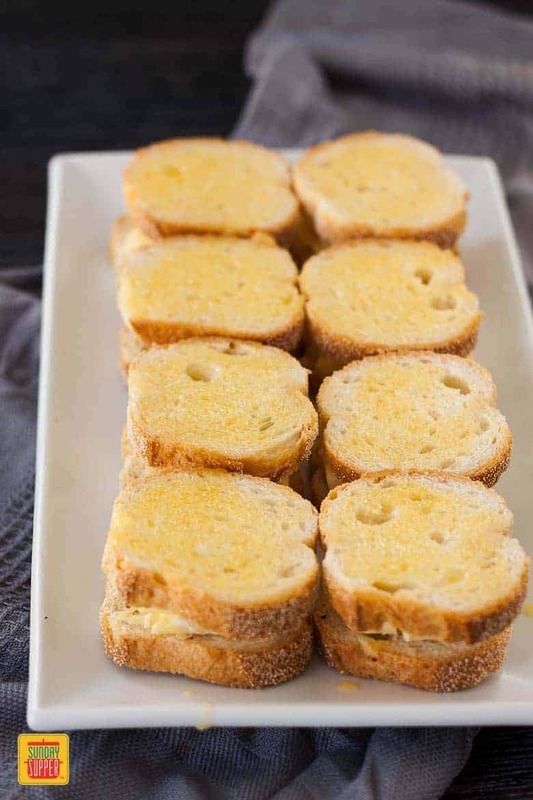 These Mini Grilled Cheese sandwiches are everything a classic grilled cheese should be. 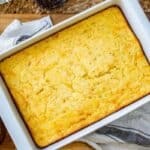 Full of flavor, but simple, warm and oozy. 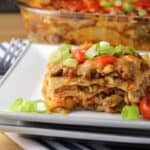 I use two cheeses in these to get a wonderful combination of flavor and melt. Just a little salt and pepper on the inside, the the outside is brushed with melted butter. That’s all you need but just make sure to choose a good full fat cheese, cheddar is best, and some mozzarella. 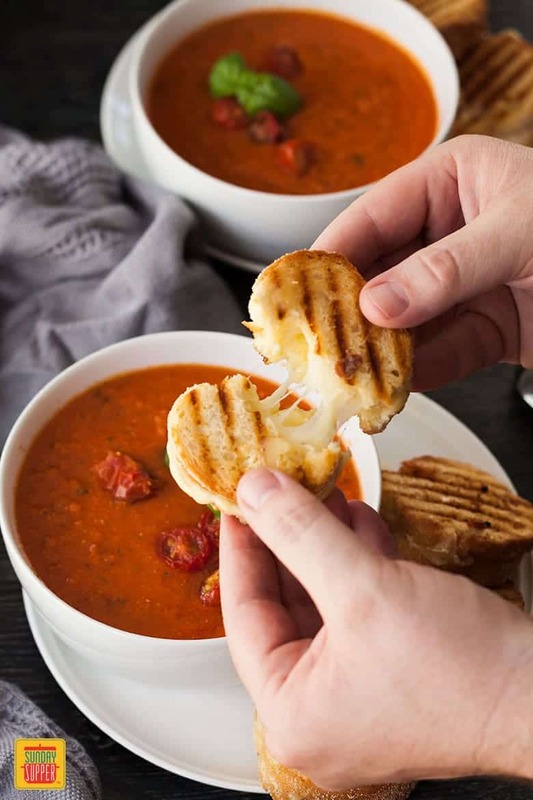 This is the perfect grilled cheese and tomato soup combo! 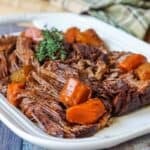 You’ll love serving this for a comforting lunch, weekday supper, or even gathering everyone around the table for a casual Sunday Supper. These are great for little hands too! 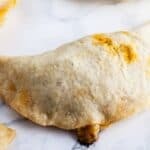 If you have a hankering for more grilled cheese, recipes check out these 20 Sunday Supper Gourmet Grilled Cheese Sandwich Recipes as well as Our BEST Grilled Cheese and Soup Pairings! Now, can you just imagine dipping that amazing mini grilled cheese into a rich roasted tomato soup? 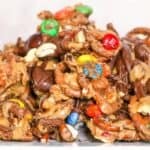 The smell that fills the house is so satisfying and then devouring it on a cool afternoon or evening takes me right back to those fond childhood memories. 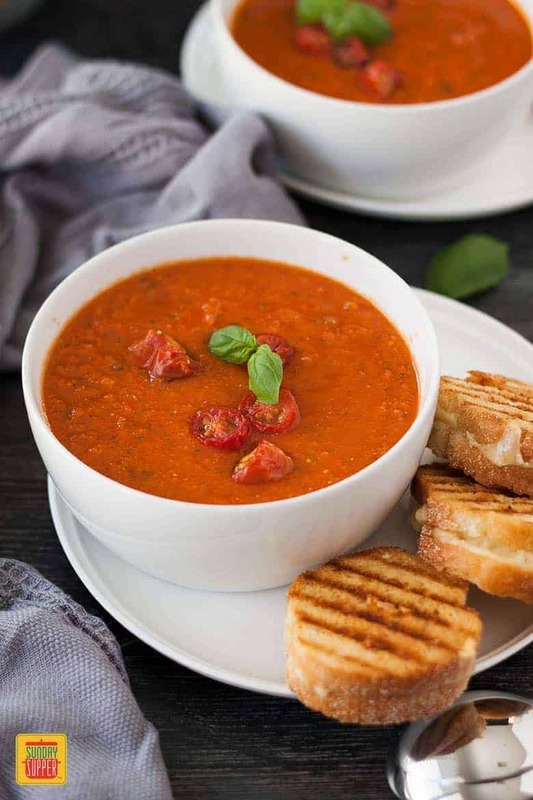 Roasted tomatoes and sundried tomato pesto make this Roasted Tomato Soup all at once comforting and nourishing. Served with Mini Classic Grilled Cheese, this is perfect for when the cooler weather hits. Preheat the oven to 200C / 400F / 180C fan forced. Line 2 large baking trays with foil and drizzle over half of the oil. Cut the roma tomatoes in half and remove the core section at the top of each half. Peel the onions and chop them in half. 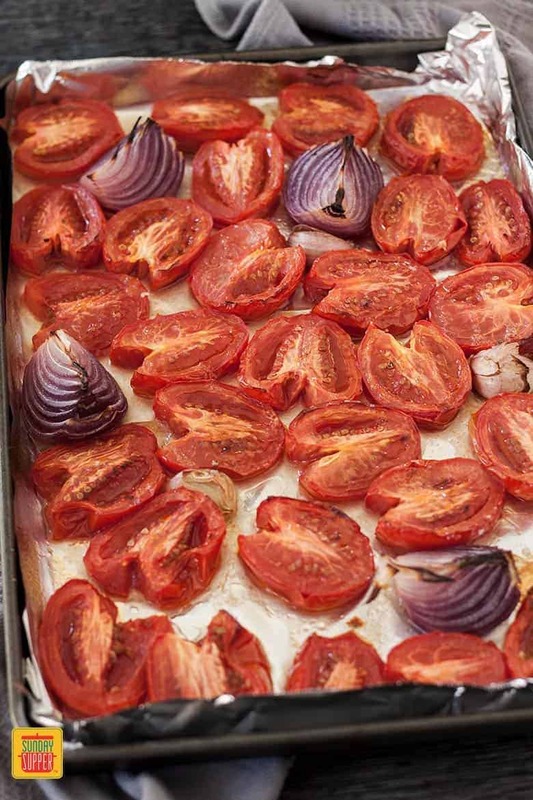 Place the tomatoes and onions, cut side up in the baking trays then scatter the unpeeled garlic cloves among them. Drizzle over the remaining oil and sprinkle with salt. Bake for 50 minutes. Cut the cherry tomatoes in half and add them to one of the baking trays for the last 10 minutes. Remove everything from the oven as soon as the cherry tomatoes are just starting to blister. Squeeze the roasted garlic out of the skins. 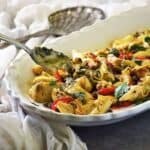 Discard the skins, then add the garlic, tomatoes, onions, the juice from the baking trays, pesto and stock to a blender (you may need to do this in 2 batches). Blend to the consistency you like. Then pour the soup into a large saucepan. Add the oregano, parsley, and salt and pepper to taste then heat for 5 minutes. While the grill is heating over medium heat, brush both sides of the mini sandwiches with melted butter. Pour the soup into serving bowls, and top with the remaining cherry tomatoes and some basil. 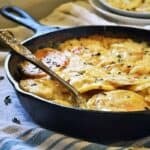 Serve with the mini grilled cheese on the side.